Oh my! Sometimes I wish I could post photos in comments, because I have a photo of me holding our first baby in just such fashion. I’m glad to see Otterday is going to be a regular feature. I’ve tried to find underwater footage of otters but I haven’t come across any. I’ve read that it is a wonderful sight. The otters at Taronga Zoo are fabulous, su. They are often scampering about their enclosure both over and under the water. Deborah, if the picture of you and your firstborn is online, do post the URL and I’ll convert it to an image in comments using the magic of Moderator Power. Ow, ow, the pain of the cuteness. Meh. I ahve spent fruitless hours (well, really, about 30 minutes in between marking essays – anything to relieve the tedium) searching for said photo on my computer, because I have such a clear visual memory of it, but if I cudgel my brain sufficiently (hard to do when stupified by said essays) I think that it might well have been a pre-digital photo, which my parents have…. This is plausible – said eldest child is nearly 10, and digital cameras were not common way, way back in those days. Time to invoke magical Moderator Power? 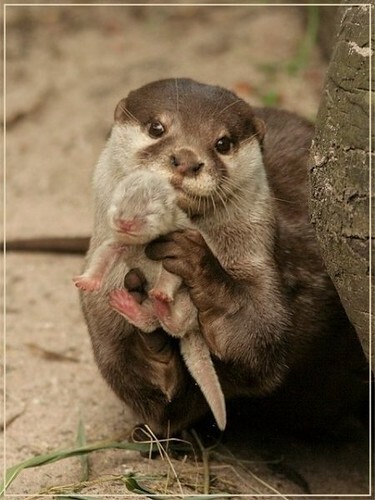 But how will Baby Otter keep its bukkit away from the LOLruses?